Y'all have probably figured it out by now, but I'm in Wisconsin for the summer. One of the horrifying realizations I had during the move-in process was that there are no grits here. I was expecting it, but it was still a very sad moment. Luckily, I had planned ahead and brought a big sack of my favorite Logan Turnpike Mill grits up from Georgia (they aren't paying me to say that, but you should email them and tell them to sponsor me), which TSA thankfully didn't confiscate. I've been eating these grits with steak, lamb chops, roasted chicken, and for breakfast basically every day. 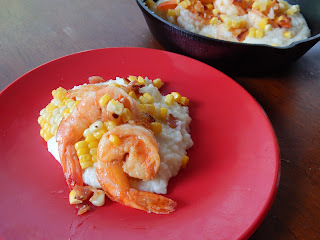 But the one true classic Southern dish that they really do belong with is shrimp and grits, and I've found a way to make it even better, using bacon of course. To make sure everyone has a chance to read all of my witty comments, I'm saving the bit about the spicy bacon corn relish until the end. 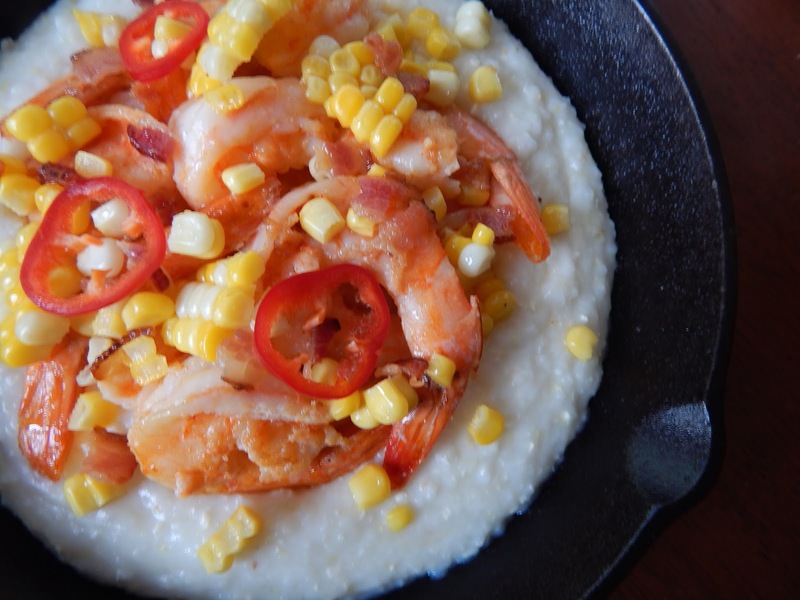 The shrimp deserve your love too, and I think I've made my stance on grits pretty clear. The grits are cooked in my usual fashion. I cook them in a mixture of water (standard), chicken broth (for flavor), and milk (for creaminess) and season them with salt and tons of butter. It's a simple side dish, but there are a few ways to make sure it comes out perfectly every time. 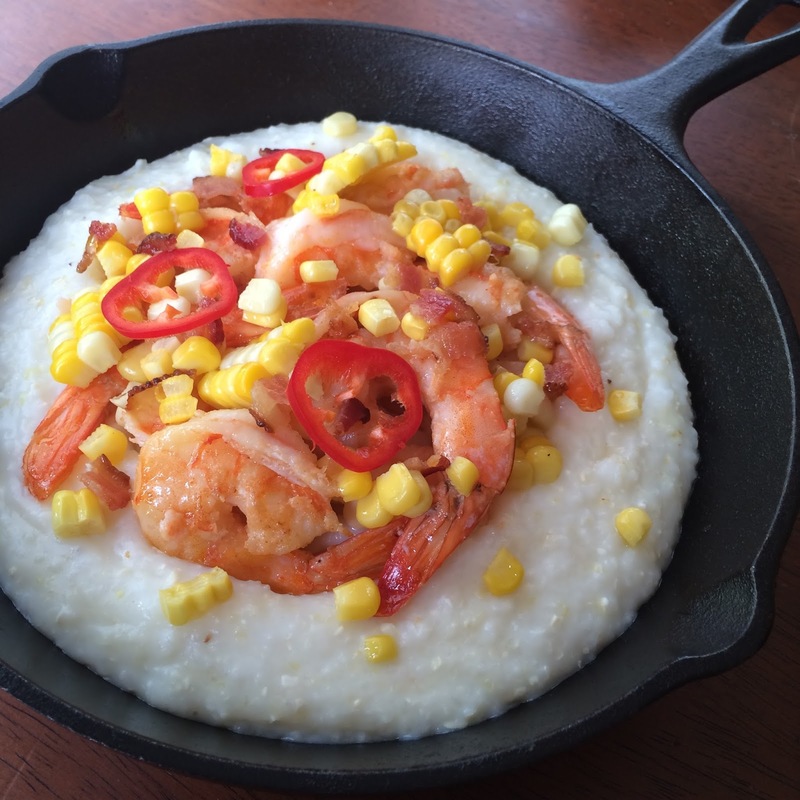 I refuse to use instant grits; they just aren't as good and you really should take the time to make these the right way. You also have to keep an eye on them and stir them fairly frequently to avoid lumps, especially when they start to thicken. Other than that, just cook the grits until they're the texture you like and keep throwing in lumps of butter when no one is looking. The shrimp are just as easy. I season them simply with salt and pepper and cook them in bacon fat (see the next paragraph) until just opaque. There's a fine line between raw and rubbery, but it's better to overcook them and not give anyone food poisoning. If you mess up and forget about them, just smother them in the delicious corn relish. Ok, it's finally time for me to tell you about this stuff. I was literally eating it with a spoon. The full name is spicy bacon and corn relish with a honey vinaigrette, but just tell people it's corn and bacon and they'll just dig in. It starts with cooking the corn; pick your method but I'll stick with my weird baking soda thing (it's in the recipe below). Meanwhile, cook up a big skillet of bacon, chop it, and cook some minced jalapenos and garlic in the bacon fat. The corn kernels, bacon, garlic, and jalapenos are mixed together and tossed in the dressing, which consists of honey, olive oil, and apple cider vinegar for a sweet and tangy touch to a salty, savory, and spicy topping. Pile it on top of the tender shrimp and the creamy grits and you've got yourself a fantastic Southern dinner. If the heat from the jalapenos isn't enough for you, I've also included a 30 second recipe for chili oil to drizzle over everything. 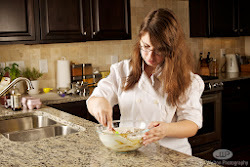 Heat the chicken broth, milk, and 1 cup water to a simmer over medium-low heat. Stir in the grits and season with salt. Cover with a tilted lid and cook, stirring often, until thick, about 15-20 minutes. Stir in the butter and season with additional salt if necessary. Meanwhile, heat a pot of liberally salted water to a boil. Add the baking soda and corn, turn off the heat, cover, and cook for 10 minutes. Cook the bacon in a large skillet. Crumble when cool and reserve the fat. Cook the jalapeño and garlic in the bacon fat until tender, about 2 minutes. Combine the corn kernels, bacon, jalapeño, and garlic. 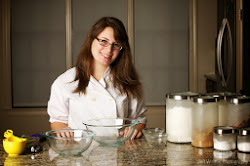 Whisk the honey, 2 T olive oil, and apple cider vinegar together; season with salt and pepper and stir into the corn mixture. Cook the shrimp in the residual bacon fat until cooked through, about 6 minutes, seasoning with salt and pepper. Whisk the remaining olive oil, hot sauce, cayenne, and chili powder together. 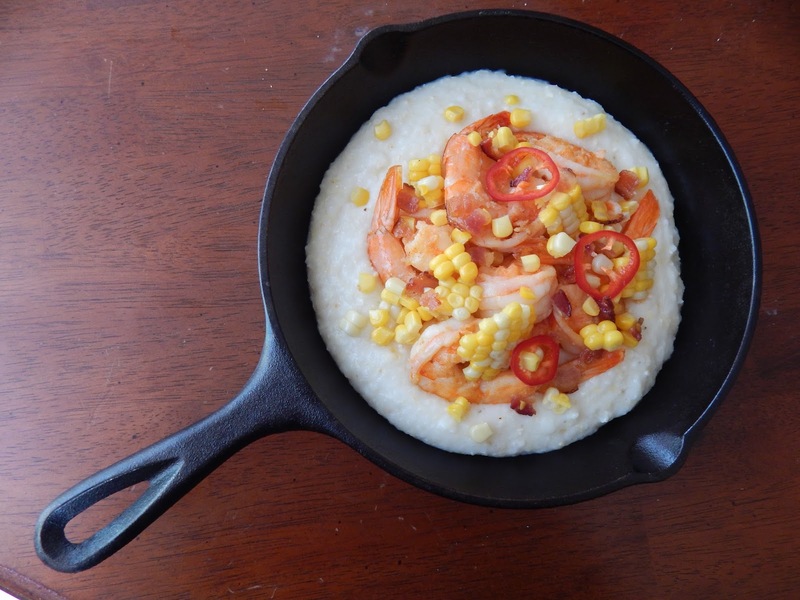 To serve, pile the shrimp on the grits, top with the corn relish, and drizzle with the chili oil.